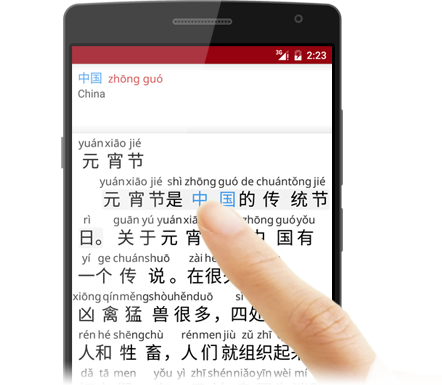 Our Chinese reading app Du Chinese which was previously only available for iPhone, is finally out on Android as well! The iOS version is available from the App Store. Du Chinese is a reading app which lets you quickly look up word and sentence translations with a simple tap. The app has lessons ranging in difficulty from newbie to master, and new lessons are constantly added. The lessons cover topics like everyday life in China, business, and the latest trends in China. The lessons not only include full translation, but also have full human voice recordings which are synchronized with the text. The word translation are also context-dependent to give you the word's meaning in the current sentence.